From left to right: the service dress blue rating badge for a special warfare operator first class and a boatswain's mate second class. United States Navy ratings are general enlisted occupations used by the U.S. Navy from the 18th century, which consisted of specific skills and abilities. 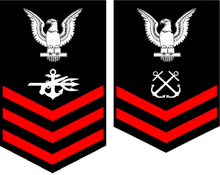 Each naval rating had its own specialty badge, which is worn on the left sleeve of the uniform by each enlisted person in that particular field. Working uniforms, such as coveralls and the camouflage Naval Working Uniform, bear generic rate designators with no rating insignia attached. For a brief period from September 2016 to December 2016, ratings were not used. However, they were reintroduced in December 2016 and remain in use. U.S. naval ratings are the equivalent of military occupational specialty codes (MOS Codes) used by the United States Army and the United States Marine Corps, the ratings system used by the United States Coast Guard, and Air Force Specialty Codes (AFSC) used by the United States Air Force. Just as a naval officer has rank, not a rate, an officer's occupation (if drawn more narrowly than an officer of the line) is classified according to designators for both officers of the line (e.g., line officers) and those of the professional staff corps. Ratings should not be confused with rates, which describe the Navy's enlisted pay-grades and ratings. Enlisted sailors are referred to by their rating and pay-grade. For example, if a sailor's has the pay-grade of E-5 (petty officer second class) and the rating of boatswain's mate, then combining the two—boatswain's mate second class (BM2)—defines both pay-grade and rating in formal address or epistolary salutation. Thus, boatswain's mate second class (BM2) would be that sailor's rate. A member that is E-1, E-2, or E-3 that belongs to a general occupational field (airman, constructionman, fireman, hospitalman, or seaman) is considered nonrated. A striker is a nonrated person who is working for promotion towards a specific rating. Example: BMSN, MMFA, AOAR. The U.S. Navy's enlisted occupational system was a product of more than 200 years of Naval evolution. The Navy of the United Colonies of the 1775 era offered only a few different jobs above the ordinary level of seaman. These included boatswain's mate, quartermaster, gunner's mate, master-at-arms, cook, armorer, and coxswain. These were titles of the jobs that individuals were actually performing and became the basis for petty officers and ratings. During this time, ship crews were taken from civilian life and enlisted for only one cruise, thus making the job at hand rather than career possibilities the primary consideration. It was not until 1841 that distinguishing marks for a rating were prescribed in the Regulations of the Secretary of the Navy and specialty marks were not added to enlisted men's uniforms until 1866. The marks consisted of the tools or instruments used in each rating's specific duty. The Master-at-Arms, the police officer of a ship, wore the star of authority and the Gunner's Mate wore two crossed cannons. Currently, all specialty marks for new ratings are approved by the Permanent Naval Uniform Board which is a division of the Bureau of Naval Personnel. As the U.S. Navy's rating system changed so did the U.S. Navy. The first steamship, mine, radar, torpedo, aircraft carrier, and many other "firsts" all established a new era in the Navy, and each directly impacted the enlisted occupation structure. During World War II, the U.S. Navy also briefly maintained a rating of "Specialist", similar to the rank in the United States Army. The rating of "Specialist" was discontinued in 1948. Since the establishment of the rating system, the U.S. Navy enlisted rating structure played a key role in career development, served as a basis for training, detailing, advancement, and simply keeping tabs on several hundred thousand U.S. Navy sailors. Beginning in June 2016, then Master Chief Petty Officer of the Navy, Michael D. Stevens, oversaw a review of the Navy's existing enlisted rating system. After Stevens's retirement, a group of senior enlisted leaders came to the conclusion that the Navy needed to replace its current enlisted system and announced the changes on 29 September 2016 with the release of NAVADMIN 218/16. The changes would have eliminated ratings in favor of the generic titles of "Seaman" (E-1 to E-3) or "Petty Officer" (E-4 to E-6) and accompanying Navy Occupational Specialty (NOS) codes. The Navy stated that the decision was motivated by a desire to assist former sailors obtain employment after their naval service by making naval job titles more congruent with their civilian counterparts, as well as to make said titles more unisex. However, the "overwhelmingly unpopular decision" was not well received as many sailors had grown accustomed and attached to their ratings, viewing them as a source of morale. In response to widespread criticism, ratings were restored on 20 December 2016.CNO John Richardson indicated he still intended to change the personnel system in the future. Rear Admiral Terry McCreary presenting a rating insignia of a mass communication specialist first class (MC1). 57 General ratings: consisting of broad occupational fields such as boatswain's mate, electronics technician, machinist's mate, fire controlman etc. 37 Service ratings: which are made up of sub categories of general ratings that require further specialized training and qualifications – Service ratings are established, changed, and removed depending on service requirements and changes in the way personnel are managed. 5 Compression ratings: Identify the combining of several general or service ratings at paygrade E-9 to form broader career fields when the occupational content is similar. These ratings exist only at the E-9 level and are not identified previously as a general or service rating. Navy Enlisted Classifications (NEC), which are numerical codes attached to a specific rating and are frequently used to indicate specialized qualifications and Emergency ratings. Emergency ratings, which are specific ratings that can be established in time of war and are distinguished by a letter of the alphabet enclosed in a diamond. Paygrades E-1 through E-3 can also have a rating abbreviation preceding their paygrade symbol if they are graduates of Class "A" schools; have received the rating designation in a previous enlistment; are assigned to a billet in that specialty as a striker; have passed an advancement examination and not been selected for advancement for reasons of numeric limitations on advancements; or have been reduced in rate because of punishment. Examples: BMSR is a boatswain's mate seaman recruit (paygrade E-1); MMFA is a machinist's mate fireman apprentice (paygrade E-2); MRFN is a machinery repairman fireman (paygrade E-3). HN is hospitalman, which is a hospital corpsman with the paygrade of E-3. Air traffic controllers assist with the speedy flow of air traffic by directing and controlling aircraft. They operate field lighting systems and communicate with aircraft. They furnish pilots with information regarding traffic, navigation, and weather conditions, as well as operate and adjust ground-controlled approach (GCA) systems and interpret targets on radar screens and plot aircraft positions. Aviation machinist's mates are usually assigned to billets concerned with the maintenance of turbo-jet aircraft engines and associated equipment. They are responsible for the maintenance and replacement of aircraft engines and accessories, as well as performing the duties of flight engineers. Aviation Electrician's Mates are responsible for aircraft electrical power generating and converting systems. They maintain lighting, control, and indicating systems and can install as well as maintain flight and engine instrument systems. Aerographer's mates are the U.S. Navy's weather forecasters. They are trained in meteorology and the use of aerological instruments that monitor air pressure, temperature, humidity, wind speed, and direction. They prepare weather maps and forecasts and can analyze atmospheric conditions to determine the best flight levels for aircraft. An AG can measure wind and air density to aid the accuracy of anti-aircraft firing, shore bombardment and delivery of weapons by aircraft. Aviation ordnancemen operate and handle aviation ordnance equipment. They are responsible for the maintenance of guns, bombs, torpedoes, rockets, and missiles. Their duties include the stowing, issuing, and loading of munitions and small arms. Aviation support equipment technicians perform intermediate maintenance on aviation accessory equipment at naval air stations and aboard aircraft carriers. They maintain gasoline and diesel engines, gas turbine compressor units and electrical systems. Aviation electronics technicians are responsible for the maintenance of radars, avionics, and navigation systems at all times. They do checks on equipment, and calibration of many aviation electronics systems on a regular basis. Naval aircrewman operate airborne radar and electronic equipment used in detecting, locating, and tracking submarines. They provide information for aircraft and surface navigation and act as helicopter-rescue crewmen, and function as part of the flight crew on long-range and intermediate-range aircraft. Beginning in 2009, other enlisted aviation ratings that perform flight engineer or loadmaster duties in Navy aircraft will convert to the AW rating. Aviation maintenance administrationmen perform clerical, administrative, and managerial duties necessary to keep aircraft maintenance activities running smoothly. They schedule and coordinated the maintenance workload, including inspections and modifications to aircraft and equipment. Aircrew survival equipmentmen are responsible for the packing and care of parachutes. They maintain flight clothing, rubber life rafts, life jackets, oxygen-breathing apparatus, protective clothing, and air-sea rescue equipment. The abbreviation comes from the former official title (still used informally) of parachute rigger. I^ : ABE, ABF, and ABH combine at paygrade E-9 to the rate of Master chief aviation boatswain's mate (ABCM). II^ : AM, AME, and AD combine at paygrade E-9 to the rate of Master chief aircraft maintenanceman (AFCM). III^ : AE and AT combine at paygrade E-9 to the rate of Master chief avionics technician (AVCM). IV^ : 2009 AW rating merged with all other aircrew NEC's and changed their title from aviation warfare system operators to naval aircrewman. Navy builders are like civilian construction workers. They are skilled carpenters, plasterers, roofers, cement finishers, asphalt workers, masons, and painters. They build and repair all types of structures including: piers, bridges, towers, schools, offices, houses, and other buildings. Construction mechanics maintain many types of construction machinery including; buses, dump trucks, bulldozers, rollers, cranes, backhoes, and pile drivers. They work on gasoline and diesel engines and transmissions. They also repair electrical, hydraulic, pneumatic and steering systems. Engineering aides provide construction engineers with information needed to develop final construction plans. They conduct surveys for roads, airfields, buildings, etc. They perform soil tests, prepare topographic and hydrographic maps. They also survey for sewers, water lines, drainage systems and underwater excavations. Equipment operators work with heavy machinery such as bulldozers, power shovels, pile drivers, etc. They use this machinery to dig ditches, excavate for building foundations, break up old concrete or asphalt paving and pour new paving. They grade and remove debris from construction sites, raise girders, and move and set in place other pieces of equipment or materials needed for the job. at paygrade E-9 to the rating of Master chief constructionman (CUCM). II^ : CE and UT combine at paygrade E-9 to the rating of Master chief utilitiesman (UCCM). III^ : CM and EO combine at paygrade E-9 to the rating of Master chief equipmentman (EQCM). Boatswain's mates train and supervise personnel in all activities relating to marlinspike, deck, and boat seamanship, and oversee the maintenance of the ship's external structure and deck equipment. They act as petty officers in charge of small craft and may perform duties as master-at-arms, serve in or take charge of gun crews, and damage control parties. Boatswain's mates are also responsible for the "deck side" watch. In port, three of the crew are on deck watch 24/7 (in hazardous areas such as war zones there are more than three, depending on ship's size). They are the Officer of the Deck, Boatswain's Mate of the watch, and Messenger of the Watch (usually a Seaman or Seaman Apprentice). They are stationed very close to the gangway and monitor all the comings and goings of persons to and from the ship. At sea the boatswain's mate of the watch is within ear shot of the conning officer (on the bridge). The boatswain's mate of the watch supervises the rest of the enlisted watch standers on deck. They include helmsman, messenger of the watch, and all the look outs. In port or at sea the boatswain's mate of the watch is charged with the responsibility of making all announcements to the crew; everything from chow call to general quarters (battle stations). Culinary specialists prepare menus and order food items. They operate galley and dining facilities, manage large facilities, keep records for food supplies and financial budgets, and can even serve as flight attendant aircrewmen. They can also serve as a personal food service specialist, household/estate manager or chef for an admiral, the First Family, President of the United States at Camp David and the White House, to the Vice President at Number One Observatory Circle or for a commanding officer aboard ship or at shore bases. Ashore, Culinary Specialists often manage and maintain clubs, TAD hotels and Permanent Party naval barracks. Cryptologic technicians control the flow of messages and information and also conduct electronic warfare. Their work depends on their specific branch: CTAs or administration cryptologic technicians (as of 01 OCT 07 CTA merged with the YN rating) perform administrative and clerical duties that control access to classified material. CTIs or interpretive cryptologic technicians handle radiotelephone communications and foreign language translation. CTMs or maintenance cryptologic technicians maintain electronic and electromechanical equipment. CTNs or networking cryptologic technicians handle computer communication. CTRs or collection cryptologic technicians handle all Morse code communications and operate radio direction-finding equipment. Finally, CTTs or technical cryptologic technicians deal with electronic warfare. CTTs are the first line of defense against inbound threats and anti-ship missiles. They also collect, analyze, and provide electronic intelligence support to commands throughout the world. Explosive ordnance disposal technicians locate, identify, render safe and dispose of all forms of ordnance (conventional, nuclear, chemical, biological, military, and improvised) both U.S. and foreign made. Parachute or Helicopter insertion and deep-sea diving capabilities are sometimes necessary to perform this mission. In addition to working closely with other military services, EOD technicians occasionally assist civilian law enforcement agencies. Electronics technicians are responsible for electronic equipment used to send and receive messages, detect enemy planes and ships, and determine target distances. They maintain, repair, and calibrate all electronic equipment used for communications, detection tracking, identification, and navigation. Specially qualified electronics technicians are employed onboard nuclear-powered ships to operate the nuclear reactor and maintain its control subsystems. Fire controlmen (FC's) maintain the control mechanism used in weapons systems on combat ships. Complex electronic, electrical and hydraulic equipment is required to ensure the accuracy of Navy guided-missile and surface gunfire-control systems. They are responsible for the operation, routine care and repair of this equipment, which includes radars, computers, weapons direction equipment, target designation systems, gyroscopes and rangefinders. Fire controlman - Aegis (FCA's) maintain the Aegis Combat System, an integrated naval weapons system on the Ticonderoga-class cruiser and the Arleigh Burke-class destroyer. Fire control technicians maintain the electronic equipment used in submarine weapons systems. They are responsible for the operation and maintenance of the complex electronic, electrical and mechanical equipment required to ensure the accuracy of Navy guided-missile systems and underwater weapons. They are responsible for ship safety by recognizing and analyzing data from several critical systems including sonar, radar, periscope, radio, and torpedo inputs. Information systems technicians design, install, operate, and maintain state-of-the-art informations systems. This technology includes local and wide area networks, mainframe, mini and microcomputer systems and associated peripheral devices. They also write programs to handle the collection, manipulation and distribution of data for a wide variety of applications and requirements. They perform the functions of a computer system analyst, operate telecommunications systems including automated networks and the full spectrum of data links and circuits. Legalmen are the Navy's paralegals. They assist Staff Judge Advocates in the proper administration of military justice and administrative law, such as courts-martial, nonjudicial punishment, and administrative separation. They work in Region Legal Service Offices (RLSO), Defense Service Offices, aboard aircraft carriers and large amphibious ships, and at various independent duty locations. Legalmen assist service members, retirees, and their family members with powers of attorney, wills, tax returns, voter registration procedures, immigration and customs regulations, Social Security regulations, and veterans' benefits. Logistics specialists manage inventories and issuance of repair parts/general supplies and specialized supplies (e.g., personal flight gear for naval aircrews or specialized combat equipment for Navy SEALs or Naval Military Construction Battalion "Seabees"), as well as distribute mail for naval ships, submarines, aviation squadrons, and shore-based activities. They procure, receive, store and issue material and repair selected components. They utilize financial accounting and database systems to perform inventory and financial management functions. Additionally, they sort and distribute all official and personal mail, manage money order and stamp inventories, and maintain financial and inventory reports. Mass communication specialists are public affairs and visual information experts. They present the U.S. Navy story to audiences in the Navy and to the rest of the world through a variety of media. Mass communication specialists write and produce print and broadcast journalism, news, and feature stories for military and civilian newspapers, magazines, television and radio broadcast stations. They record still and video photography of military operations, exercises, and other Navy events. Minemen test, maintain, and repair mines and their components. They are responsible for assembling, testing, and delivering mines to the planting agent. They maintain minehandling and minelaying equipment. At sea, minemen primarily man Avenger Class mine countermeasures ships as well the new Independence Class littoral combat ships as a part of the MCM module. Their duties at sea include but are not limited to: operating mine hunting sonar, operating remote controlled submersibles in prosecuting mine-like contacts, rigging and deploying minesweeping gear as well as standing normal underway deck and combat information center watches. Missile technicians operate and maintain the UGM-133 Trident II D5 missile Strategic Weapon System (SWS) carried aboard ballistic missile submarines and at strategic weapons facilities. Missile technicians operate and maintain electronic, mechanical, hydraulic and pneumatic strategic weapon subsystems, test and operate the MK98 fire-control system and MK 6 guidance system, perform classified targeting operations, and provide physical security to nuclear weapon systems. Navy counselors offer vocational guidance to Navy personnel — individually and in groups — aboard ships and at shore facilities. They assess the interests, aptitudes, abilities and personalities of individuals and assist them in reaching their full potential. They are responsible directly to the command triumvirate (CO, XO, CMC) and report on many items such as retention, attrition, advancement, testing and various other facets of the career development program. Additionally, it is their keen eye and attention to detail that ensure personnel throughout the command are updated on current Navy policies in regards to career management, off duty education and administrative procedures, among various other responsibilities. Personnel specialists provide enlisted personnel with information and counseling about Navy jobs, opportunities for general education and training, and promotion requirements. They assist enlisted members' families with legal aid or reassignments in hardship situations. Personnel Specialists keep records up to date, prepare reports, type letters and maintain files. Religious program specialists assist Navy chaplains with administrative and budgetary tasks. They serve as custodians of chapel funds, keep religious documents and stay in contact with religious and community agencies. They prepare devotional and religious educational materials, set up volunteer programs, operate shipboard libraries, supervise chaplains' offices and perform administrative, clerical and secretarial duties. They train personnel in religious programs and publicize religious activities. Special warfare boat operators (SWCC - special warfare combatant-craft crewmen) drive fast speedboats down narrow, winding rivers, or the open ocean while performing high speed, medium range, or all weather insertion/extraction of special operations forces. They participate in maritime interdiction operations, tactical swimmer operations, intelligence collection, operation deception, and coastal patrol. Special warfare operators are Navy SEALs, which are the Navy's primary unconventional warfare units that conduct warfare at SEa, in the Air, and on Land (SEAL). A SEAL's core skills consist of: sniper, breacher, communicator, maritime/engineering, close air support, corpsman, driver, navigator (rural/urban/protective security), heavy weapons operator, sensitive site exploitation, air operations (parachuting/helicopter insertion, etc. ), climber, interrogator, technical surveillance, and advanced special operations. SEALs oversee ocean-borne mine disposal, carry out direct action raids against military targets, conduct reconnaissance, and secure beachheads for invading amphibious forces. Sonar technicians are responsible for underwater surveillance. They assist in safe navigation and aid in search and rescue and attack operations. They operate and repair sonar equipment and jam enemy sonars. Sonar Technicians operate, maintain and repair sonar systems, antisubmarine warfare fire control equipment and other various equipment associated with underwater detection, counter-detection, warfare and communications. Yeomen perform administrative and clerical work. They deal with visitors, coordinate worldwide travel, submit passport applications, telephone calls and incoming mail, and assist various ships, squadrons, staff commands, and special warfare teams around the world with administrative tasks. They write and type business and social letters, notices, directives, forms and reports. I^ : Cryptologic technician now includes former rating of electronic warfare technician (EW). II^ : Information systems technician now includes former rating of cryptologic technician – communications (CTO). III^ : Quartermaster QM now exists as electronics technician (navigation) ETV on submarines. Damage controlmen perform the work necessary for damage control, ship stability, fire-fighting. They also prepare defenses against chemical, biological and radiological (CBR) warfare attacks. They instruct personnel in damage control and CBR defense and repair damage-control equipment and systems. Electrician's mates are responsible for the operation and repair of a ship's or station's electrical power plant and electrical equipment. They also maintain and repair power and lighting circuits, distribution switchboards, generators, motors and other electrical equipment. Specially qualified electrician's mates are employed onboard nuclear-powered ships to maintain the control subsystems in nuclear reactors. Enginemen are responsible for internal diesel and gasoline engines. They also maintain refrigeration, air-conditioning, distilling-plant engines and compressors. Gas turbine system technicians are responsible for all gas turbine engines. They maintain propulsion machinery, including gears, shafting and controllable pitch propellers, assigned auxiliary equipment propulsion control systems, electrical and electronic circuitry up to the printed circuit module, and alarm and warning circuitry. They handle administrative tasks related to gas turbine propulsion system operation and maintenance. Hull maintenance technicians are responsible for maintaining ships' hulls, fittings, piping systems and machinery. They install and maintain all shipboard and shore based plumbing and piping systems. They look after a vessel's safety and survival equipment and perform many tasks related to damage control. Interior communications electricians operate and repair electronic devices used in the ship's interior communications systems, SITE TV systems, 1MC (public address system), electronic megaphones and other announcing equipment. They are responsible for the gyrocompass systems. Machinist's mates are responsible for the continuous operation of the many engines, compressors, gears, refrigeration, and air-conditioning equipment along with other types of machinery onboard ships and shore installations. They are responsible for the ship's steam propulsion and auxiliary equipment and the outside (deck) machinery. Specially trained and qualified machinist's mates are deployed onboard nuclear-powered ships to maintain the machinery and piping in nuclear reactors. Some nuclear machinists mates (engineering laboratory technicians) receive additional specialization in health physics and maintaining reactor chemistry. Navy divers are responsible for a wide variety of tasks like underwater ship maintenance, construction, and underwater rescue. They are assigned to Naval Special Warfare Units to provide diving technical expertise and supervisory support to all submersible operations. I^ : The Navy has announced a merger of the DC, HT and MR ratings into repair technician (RT) is pending but has not announced a timeline. II^ : Prior to March 1 March 2014, IC and EM combine at paygrade E-9 to the rating of master chief electrician's mate (EMCM). After 1 March 2014, IC is moving to the Seaman ratings group. Command master chief petty officers (CMDCM) are the senior most E-9 enlisted member of a United States Navy unit and are senior advisers to their unit's commanding officer. Fleet master chief petty officer, force master chief petty officer, and Master Chief Petty Officer of the Navy are the senior most CMDCM to a fleet or force level command and the U.S. Navy itself who are senior advisers to the flag officer in command at that level. Aviation storekeeper AK Merged into Storekeeper on 1 January 2003. AMS Merged into Aviation structural mechanic on 1 March 2001. ASM Merged into Aviation support equipment technician on 1 March 1990. AQ Merged into Aviation electronics technician on 1 January 1991. Boiler technician BT Merged into Machinist's mate on 1 October 1996. Merged into Information systems technician on 1 March 2006. Merged into Yeoman on 1 October 2007. Disbursing clerk DK Merged into Personnel specialist on 1 October 2005. Draftsman DM Merged into Mass communication specialist on 1 July 2006. Data processing technician DP Merged into Radioman on October 1, 1998. Data systems technician DS Merged into Electronics technician and Fire controlman on 1 October 1998. 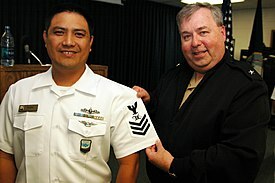 Dental technician DT Merged into Hospital corpsman on 30 August 2005. Electronic warfare technician EW Merged into Cryptologic technician on 1 October 2003. Journalist JO Merged into Mass communication specialist on 1 July 2006. Lithographer LI Merged into Mass communication specialist on 1 July 2006. Mess management specialist MS Changed to Culinary specialist on 15 January 2004. Ocean systems technician OT Merged into Sonar technician on 1 October 1998. Postal clerk PC Merged into Logistics specialist on 1 October 2009. Effective on 1 January 2010. Photographers mate PH Merged into Mass communication specialist on 1 July 2006. Personnelman PN Merged into Personnel specialist on 1 October 2005. Radarman RD Merged into Operations specialist in 1972. Radioman RM Submarine: Merged into Electronics technician in 1997. Surface: Merged into Information systems technician in November 1999. Storekeeper SK Merged into Logistics specialist on 1 October 2009. Effective on 1 January 2010. Signalman SM Disestablished on 4 November 2003 and duties absorbed by Quartermaster rating. Torpedoman's mate TM Submarine: Merged into Machinist's mate in 1997. Surface: Merged into Gunner's mate on 1 October 2007. This article incorporates text in the public domain from the United States Navy. ^ a b Faram, Mark D.; Larter, David B. (22 August 2017). "Ratings restored: Effective immediately, sailors will get their job titles back". Navy Times. Sightline Media Group. ^ "U.S. Navy Officer Ranks and Enlisted Rates". Navy Data. U.S. Navy. Retrieved 2006-12-27. ^ a b "Trainee Guide" (PDF). US Navy. Recruit Training Command. July 2009. Archived from the original (PDF) on 13 September 2012. Retrieved 18 October 2012. ^ a b "Enlisted Ratings and Jobs in the U.S. Navy". Navy Data. U.S. Navy. Retrieved 2007-01-08. ^ a b c Faram, Mark D. (9 October 2016). "The inside story of how the Navy's top brass eliminated ratings". Navy Times. Sightline Media Group. ^ LaGrone, Sam (29 September 2016). "UPDATED: Navy Eliminating 241-Year-Old Rating System in New Enlisted Rank Overhaul". USNI News. U.S. Naval Institute. ^ Burke, Robert P. (16 September 2016). "NAVADMIN 218/16". US Navy. USA Department of the Navy. ^ LaGrone, Same (20 December 2016). "Navy to Restore Enlisted Rating Titles After Months of Criticism". USNI News. U.S. Naval Institute. ^ a b Fellman, Mark D. Faram, Sam (22 August 2017). "Navy scuttles sailors' enlisted rating titles in huge career shake-up". ^ a b Dan Petty. "Chief of Naval Operations Video Gallery". Navy.mil. Retrieved 2016-12-24. ^ a b This story was written by Chief of Naval Personnel Public Affairs (2016-09-29). "Navy Announces Enlisted Rating Modernization Plan". Navy.mil. Retrieved 4 December 2017. In modernizing our enlisted rating system we are not only giving our Sailors increased opportunities within the Navy, such as a higher level of flexibility in training and detailing, but also increasing their opportunities when they transition out of the service. In aligning the descriptions of the work our Sailors do with their counterparts in the civilian world, we more closely reflect the nation we protect while also making it easier for our Sailors to obtain the credentials they'll need to be successful in the private sector. ^ a b This story was written by Petty Officer 2nd Class Charlotte C. Oliver and Petty Officer 2nd Class Jackie Hart, Defense Media Activity. "Personnel Changes on the Horizon". Navy.mil. Retrieved 2016-12-24. ^ Faram, Mark D. (22 August 2017). "Navy looks to remove 'man' from all job titles". Navy Times. Sightline Media Group. ^ "Navy Ratings". Blue Jacket.com. Retrieved 2007-01-07. ^ a b c d e f g h i j k l m n o p q r s t u v w x y z aa ab ac ad ae af ag ah ai aj ak al am an ao ap aq ar as at au av aw "U.S. Navy Enlisted Ratings" (PDF). University of California Berkeley, Naval Reserve Officer Training Corps. U.S. Navy. Archived from the original (PDF) on 2006-12-11. Retrieved 2006-12-27. ^ "Enlisted Rank Insignia Aviation". Navy Data. U.S. Navy. Retrieved 2007-06-18. ^ a b c "Enlisted Rating Insignia, Construction Specialties". U.S. Navy. Archived from the original on 2007-02-17. Retrieved 2007-06-13. ^ "Mess Management Specialists Transform into Culinary Specialist". U.S. Navy Newsstand. U.S. Navy. Archived from the original on 2004-03-06. Retrieved 2006-12-27. ^ "Navy Enlisted Rating Explosive Ordnance Disposal". Rod Powers. Military About.com. Retrieved 2006-12-28. ^ "Navy Enlisted Rating Descriptions Information System Technician (IT)". U.S. Military about.com. U.S. Navy. Retrieved 2006-12-27. ^ "Minesweepers 'some of the most versatile' sailors - News". Stripes. Retrieved 2016-12-24. ^ a b "Special Warfare Combatant-craft Crewman". Rod Powers. U.S. Military about.com. Retrieved 2006-12-28. ^ a b c "Enlisted Rank Insignia Administration". Navy Data. U.S. Navy. Retrieved 2006-12-27. ^ "Navy Diver". Navy.com. U.S. Navy. Retrieved 2006-12-28. ^ "Enlisted Rating Insignia Engineering & Hull". Navy Data. U.S. Navy. Retrieved 2006-12-29. ^ "ESTABLISHMENT OF ICCM RATE AND REDESIGNATION OF INTERIOR COMMUNICATIONS". U.S. Navy. Retrieved 20 December 2013. ^ a b c d e f g h i j k l m n o p q r "Disestablished enlisted rating insignia". Bureau of Naval Personnel. U.S. Navy. Archived from the original on 2006-12-06. Retrieved 2007-01-11. ^ "United States Naval Aviation 1910–1995" (PDF). Navy.mil. U.S. Navy. Retrieved 2009-01-19. ^ "Mess Management Specialist Rating Name Changes". Navy.mil. U.S. Navy. Retrieved 2007-12-23. ^ "Torpedoman's Mate and Gunner's Mate Ratings Merge". Navy.mil. U.S. Navy. Retrieved 2010-10-14.